Make decisions that will benefit your dog. Not a pharmaceutical company or a veterinary clinic, or to advance a research study. Your dog, your money, your decisions! The information on this site will help you begin to learn about canine cancer and what you can do to help your dog. Then, order my book. You will learn everything you need to know to become your best friend's best advocate. Your anxiety will fade away! 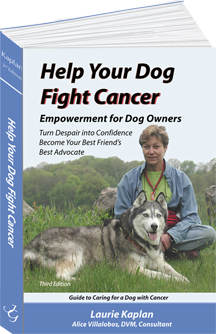 You will feel empowered to move forward confidently with your dog's fight against cancer. Which treatment option is best for your dog? While you are busy researching canine cancer, your dog's cancer is busy progressing. "Laurie, my service dog Nellie was sent home at 13 to die 'within weeks.' A friend gave me your book. Nellie is now 15. Thank you for these two precious years!. I just sent your book to another in need. Blessings!" This book provides the information you need to make the best decisions for your dog. It contains information you will not find anyplace else. Are your friends and family supportive or do they say “It’s just a dog”? You are not alone! Veterinary medical researcher and writer. Founder and administrator of the Magic Bullet Fund. 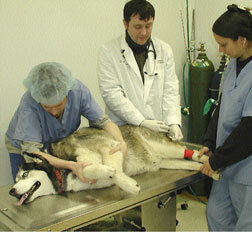 Has helped more than 600 dogs through cancer treatment. Proceeds from this book are donated to the Magic Bullet Fund. If you want a personal consult to review your dog's condition and your options, schedule a consult. We will talk about your dog's cancer, diagnostics, treatment options, diet, supplements and more. We will talk about all of your questions and concerns.